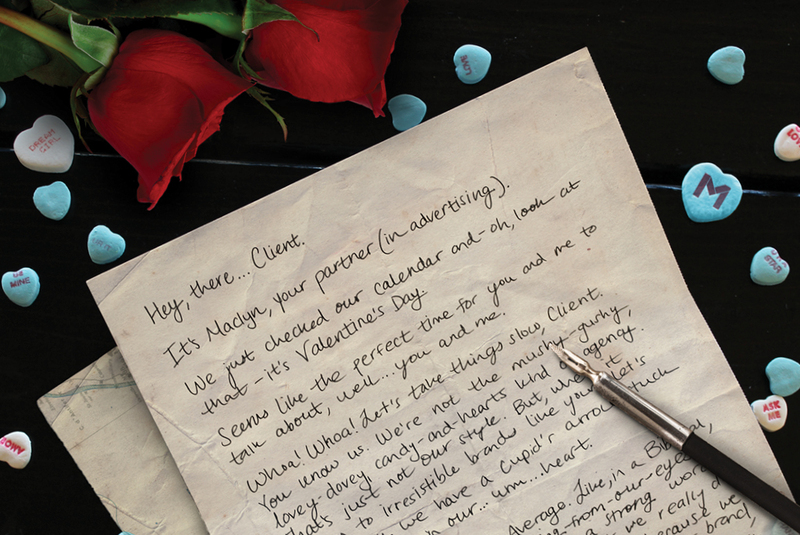 From MACLYN, With Love: An Open Letter to Our Clients. It’s MACLYN, your partner (in advertising). We just checked our calendar and – oh, look at that – it’s Valentine’s Day. Seems like the perfect time for you and me to talk about, well… you and me. Whoa, whoa! Let’s take things slow, Client. You know us. We’re not exactly the mushy-gushy, lovey-dovey, candy-and-hearts kind of agency. That’s just not our style. But, when it comes to irresistible brands like yours, let’s just say we have a Cupid’s arrow lodged firmly in our, um, heart. At MACLYN, we hate Average. Like, in a Biblical, fire-and-brimstone-shooting-from-our-eyes kind of way. Now, ‘hate’ is a strong word – not very festive, either – but we really do hate all things Average. That’s because we love your brand. And we love your brand, because we know what it means to you. You see, Client, you have an amazing product/service. Seriously, it’s flippin’ fantastic; we can’t keep our hands off it. But, as phenomenal as your product/service is, that’s not why people love you. People love you because they L-O-V-E your B-R-A-N-D. They flutter their eye-lashes at your mission. They have your logo tattooed on their lower backs. They get flustered just thinking about you… because they looooove the Big Idea that defines you. With the right brand, people have fallen in love with you in a way they could never love just a product or just a service. Like, in a filthy, Justin Timberlake sort of way. Oh, gosh – now you’re blushing. Well, hey; so are we. Thanks for joining us in the fight against Average, day-by-day, hand-in-hand, shield-to-shield.